Arachnophobia trigger alert! If you freak out at the mere sight of a spider, real or chocolate, turn around and run for the hills! This post is crawling with chocolate spiders and there's a short animated film about a man with a spider crawling all over him. Are you ready? Let's go! It's a spider infestation! They're eating my cookies! What a fun and super simple treat for Halloween, isn't it? All you have to do is bake a batch of your favorite chocolate chip cookies, place some chippers on top of the cookies before you bake them, draw some chocolate spidey legs on them after you bake them, and you're good to go! I'd love to lie to you and tell you that this was my brilliant idea, but that would make me a lame little sausage, wouldn't it? The brilliant mind behind these creepy crawly cookies is actually Beth at Hungry Happenings. 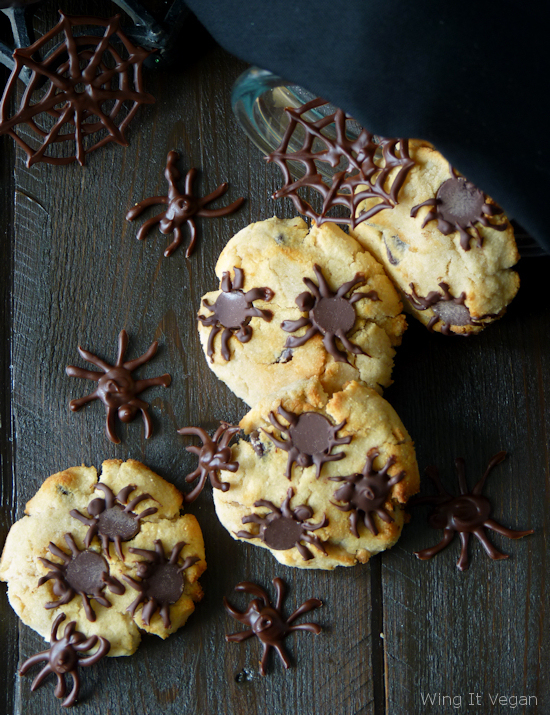 The cookie recipe itself isn't vegan, but you can pipe chocolate spider legs on top of any cookie, right? If you don't have a favorite vegan chocolate chip cookie recipe yet, I can highly recommend Dreena Burton's Homestyle Chocolate Chip Cookies. They are awesome! Unfortunately this time I didn't use Dreena's recipe and tried a gluten-free recipe I'd never made before. The cookies themselves weren't very good, but that's a Wing-It, Don't Fling It story for another day. 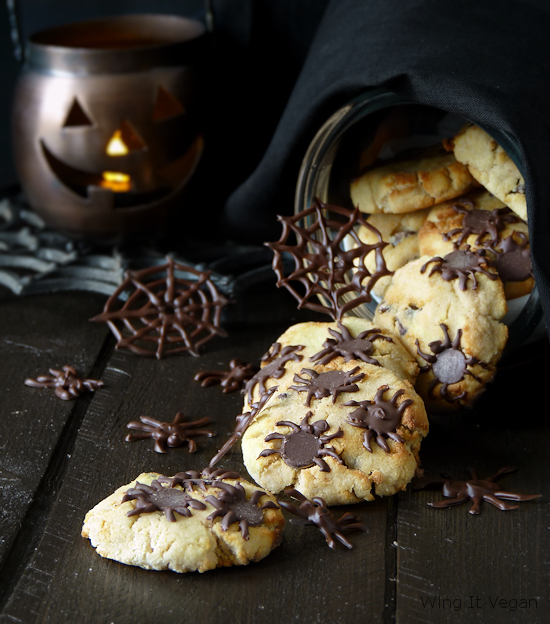 See the chocolate spiders that are crawling around the cookies? They are the same type of spider that I made five years ago during my very first Halloweegan. Good times! 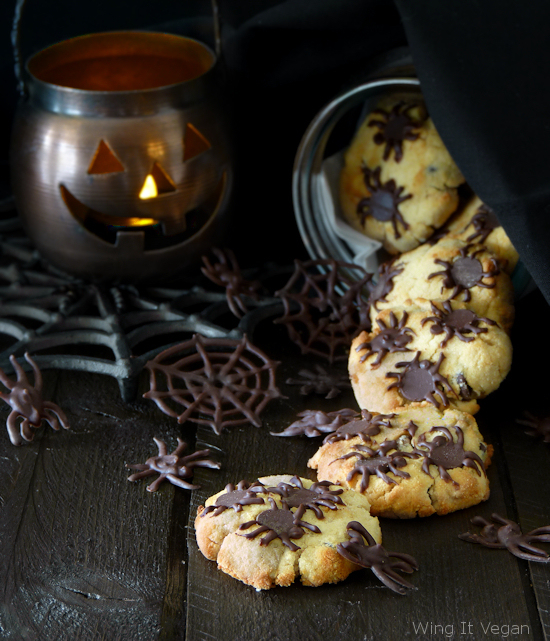 Here is how to make Spider Infested Chocolate Chip Cookies. 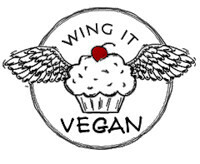 Here is Dreena Burton's recipe for vegan Homestyle Chocolate Chip Cookies (not pictured here). Here is the pattern and instructions for the chocolate spiders that are crawling around the cookies. Thank you for sharing this awesome idea, Beth! Now let's wrap things up with Simon's Cat's latest video! I must warn you again about the spider crawling all over Simon. Even though it is an animation you might still find it unsettling. That's it for me this Halloweegan - at least I made something this year! Happy Halloween to everyone who is celebrating! That video was hilarious! That'd be me if a spider was anywhere near me, haha. Simon's Cat is so funny! Mr. Wing-It is in charge of catching and evicting spiders around here. I simply cannot go near them!! Your cookies look awesome. Thanks for linking to my post, I do appreciate it. I'm so happy to see how popular these cookies have become this year. Have a great Halloween. Thank you for sharing such a creative treat! 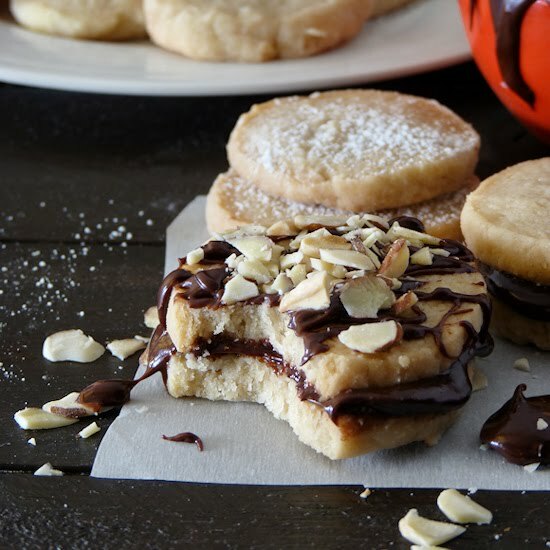 I'm not surprised to hear these cookies are very popular - they're just too awesome! The cookies are so clever and I'd love to make them, but I'm a wimp, and would probably have trouble eating them. I should try it just to see. :) The video was lots of fun. It reminded me of an incident with my husband. He was in the basement. There was an anguished scream, and I am a bad person for laughing. Poor man! One can't hold back the laughter when somebody freaks out about seeing a spider though. I probably would have laughed too! Hopefully the spider didn't actually walk all over his body. That would be terrifying!! Oh I would have screamed like a little girl!!! And then I would have taken a two hour shower with a brillo pad to scrub any spidery feelings off my skin! Oh my comment just got deleted! I'll summarize - I don't mind spiders at all and in fact, have a houseful of them. They are my roomates, and they multiply like gremlins. They probably go outside during the day and pass on the word that there is a kind old crazy lady down the street who doesn't kill spiders in her house. I wouldn't have any problem eating these cookies though, my spider love notwithstanding. I wouldn't ever make them though, because I am all kinds of WAY too lazy for all that business. Very cute little spider friends, I like the chocolate chip idea with the piped on legs - very simple! These are soo cute! I love it. Last year I made gingerdead men, and this year I just made lots of spideweb cupcakes. I'll have to keep this in mind next time around! these are hilarious. I'm gonna have to remember to make some next year to scare my workmates! Or maybe just next Friday? Dreena's chocolate chip cookie recipe is my favorite! So good! I love the idea of drawing little legs onto the chocolate chips. Super fun! Dreena's chocolate chip cookie recipe might very well be the best one out there! Drawing the little legs was pretty fun - and so easy!